The Minister for Defence has said he does not believe the comments about the Golan Heights by the US President will create instability in the region. US President Donald Trump had said it is time to back Israeli sovereignty over the Golan Heights, territory Israel seized from Syria in the 1967 Middle East War. 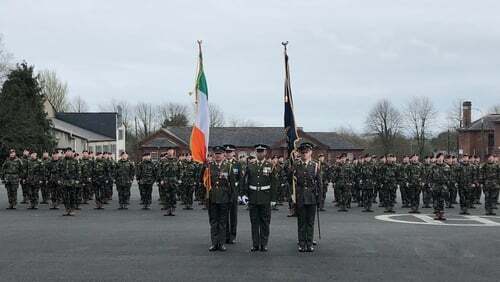 Paul Kehoe made the remarks today as he carried out the ministerial review of 130 Irish troops at the Curragh Camp in Co Kildare, ahead of their deployment to the Golan Heights later this week. The 123 men and seven women, who are members of the 59th Infantry group, will help to maintain the ceasefire between Israel and Syria as part of a United Nations peacekeeping mission. Minister Kehoe also said he does not share the comments of Donald Trump, which the President tweeted last night. Irish personnel have been part of the UN mission in the Golan Heights since 2013. The Chief of Staff of the Defence Forces said there are no plans to review that involvement in the wake of President Trump’s comments. Vice Admiral Mark Mellet said he will "keep the security environment under review, and if there is a change in the circumstances" he will give advice to the Government.